Whether you're dealing with items a customer has returned, or an order which now needs to be cancelled that has already been marked as shipped, you will need to create a sales credit in Brightpearl. This will allow you to receive back any inventory and create all the necessary accounting for sales and tax, and refunds if required. In Brightpearl, invoice the order. This ensures no further changes can be made. It will also create accounting, but this will be reversed by the sales credit. 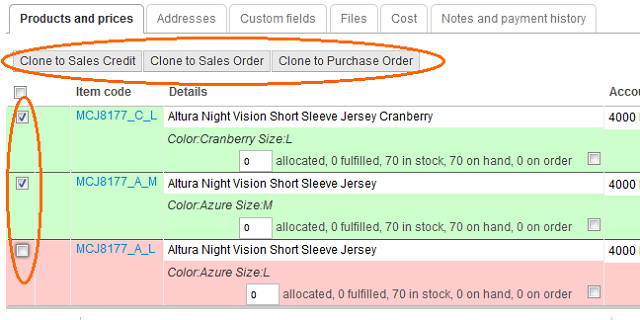 In Brightpearl, clone the items on the order to a sales credit. Mark it as credited and receive the inventory. Do not process a refund against the credit. Complete the sales credit by crediting and receiving the inventory. No refund needs to be processed since this will be automatically processed when the eBay PayPal payments are synchronized. The refund will be downloaded and the accounting credited. It will automatically be attached to the original order marking it as unpaid (since PayPal only have the original order reference is is not possible to match it to the credit). Process the sales credit by crediting and receiving inventory. Do not process a refund against the credit. Complete the sales credit by crediting and receiving inventory. No refund needs to be processed since this will be automatically processed when the eBay payments are synchronized. In Brightpearl, synchronize eBay payments.